Should you enroll your child into private swim lessons, during which he or she will have the instructor’s undivided attention? 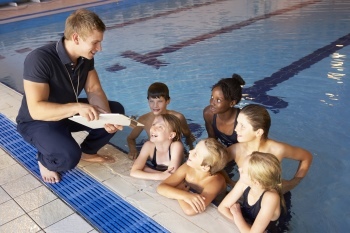 Or would your child benefit more from group swimming lessons, learning alongside other kids? The answer depends on a number of factors. Both environments offer advantages. Both also come with potential drawbacks based on how your child learns. Below, we’ll cover the most important aspects to take into account when choosing between the two types of instruction. In group swimming lessons, kids have an opportunity to spend time with other children while learning to swim. The interaction can lessen their anxiety about the water, improve their social skills, and make the lessons more engaging. Children often look forward to group lessons, because they know their friends will be there. Private lessons lack this feature as your child works one-on-one with the instructor. There are unique advantages to private swim instruction, but they don’t include peer-to-peer interaction. Most children enjoy learning to swim with their peers. There are two accommodating dynamics in effect. First, they’re encouraged to master skills they observe their friends to master. Their friends’ success motivates them to pursue the same positive feedback. A natural camaraderie develops as the students feed on each other’s progress. The second dynamic is one of friendly competition. Kids love to compete. This natural propensity drives them to learn the skills taught in the lessons. In a way, it’s a healthy form of positive peer pressure. If your child would gain no benefit from this peer-based environment, private instruction may be a more suitable option. Having said that, group swimming lessons for kids are a popular choice among parents. One of the advantages to group lessons is that your child will enjoy regular rest intervals as the instructor helps other students. Enrollees take turns performing exercises. While others are taking their turns, your child will be able to catch his or her breath. He or she will be able to relax, which makes the lessons more fun. That’s not to say your child will lack for opportunities to rest during private swim lessons. After all, the curriculum will be tailored to accommodate his or her needs. But it’s worth noting the rest intervals halt the lessons and can hamper their momentum. As you might expect, group lessons are priced lower than private lessons. Significantly lower. That doesn’t mean the groups are large. On the contrary, our indoor swim club limits the size of each group to a maximum of four students. That size ensures each child receives personal attention from the instructor while enjoying the positive effects of social interaction and peer encouragement. If your child struggles to learn in a group setting or needs extra attention from the swim instructor, private lessons are an excellent option. The higher cost may actually be more affordable in the long run as your child masters stroke mechanics and other swimming skills more quickly. How Long Before Your Child Learns To Swim? In most cases, children enrolled in group swimming lessons progress more slowly than children who receive private instruction. Kids who work one-on-one with an instructor tend to show faster improvement and mastery. That’s understandable given that they receive the instructor’s undivided attention. But it’s important to keep in mind the advantages of learning to swim in a group setting. First, your child will make new friends. Second, he or she will be able to socialize with them in a positive learning environment. Third, your child will be motivated to work harder thanks to the healthy encouragement that accompanies learning to swim with his or her peers. These advantages extend far beyond a lake or swimming pool; they benefit your child for life. If group swimming lessons sound like the right choice for your child, contact us at the Dupage Swimming Center to hear more about your options for Naperville group swimming lessons for kids. No matter what your child’s age or skill level, we offer specialized classes with experienced and friendly instructors to adapt your child to the water and provide a fun and exciting learning environment.